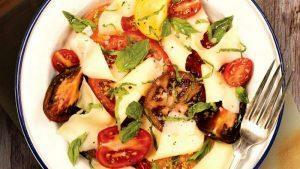 Home > Blog > Amy Campbell > Home-Cooked Meals: The Secret to a Healthier Life? 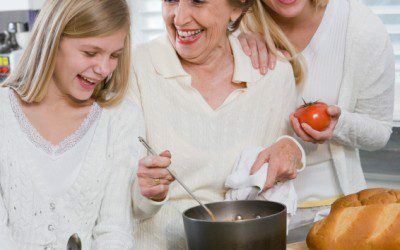 Home-Cooked Meals: The Secret to a Healthier Life? Americans love to go out to eat. Eating out is fun, quick, and easy. No pots and pans to scrub! The United States Department of Agriculture (USDA) keeps tabs on food-related data, including how much we, on average, spend on food eaten away from home. For example, in 1970, about 26% of people’s food budget was spent on food eaten away from home. In 2012, that number shot up to 43%. Why? There are a number of factors that can explain this: Many more women work outside the home now than back in the 1970s, people earn more money today and thus can spend more on eating out, more fast-food restaurants are available, making it more convenient for our busy lives, and, of course, there’s all the restaurant advertising and promotions. All of the convenience, speed, and fun of eating out comes at a price — not just a monetary price, but a price on health. Plenty of research shows that frequently eating away from home leads to higher rates of obesity, insulin resistance (which can lead to Type 2 diabetes), and high cholesterol. Researchers at Queens College, City University of New York, looked at data from more than 8,300 American adults between 2005 and 2010. People who at meals away from home six or more times per week had a higher body-mass index (BMI, a measure of weight in relation to height), lower levels of HDL (“good”) cholesterol, and lower blood levels of certain nutrients, such as vitamins C and E. Other research shows that people who eat out often consume more calories, fat, sugar, and sodium than folks who eat mostly at home. Eating more of your meals at home can do more than save you some money. You’ll likely be healthier as a result. Research out of Johns Hopkins Bloomberg School of Public Health indicates that people who cook most of their meals at home consume fewer calories and eat healthier, in general, than folks who don’t do that much cooking. The research looked at data from the 2007–2010 National Health and Nutrition Examination Survey from more than 9,000 adults. The findings? • Eight percent of adults cooked at home once or less per week and they consumed, on average, 2,301 calories, 84 grams of fat, and 135 grams of sugar daily. • Forty-eight percent cooked dinner 6–7 times per week and consumed, on average, 2,164 calories, 81 grams of fat, and 119 grams of sugar daily. People with diabetes who eat out often may find it more challenging to manage blood sugar levels; this isn’t surprising, since food portions tend to be larger at restaurants and you don’t always know the calorie, carbohydrate, and fat content of the meal. • Set a goal of cooking at least one dinner at home each week and then gradually work your way up. • Look for healthy recipes (such as those on this website!). There are plenty out there. Spend some time deciding on a few that you and your family may like. Keep it simple — elaborate meals aren’t necessary. • If you feel like your cooking skills are rusty, take some lessons through your local adult education center or watch cooking videos on YouTube or on the Food Network’s website. • Plan ahead. Make a list of ingredients that you’ll need. Keep some staples in your kitchen, like fresh or frozen vegetables, whole grains such as brown rice and whole wheat pasta, eggs, low-fat milk, canned beans, and cheese. It’s OK to used canned foods, but try to choose lower-sodium versions. • Semi-homemade meals are perfectly fine. Use convenience items from the grocery store, such as lower-sodium chicken broth, rotisserie chicken, precut vegetables and prepared salad greens, and precooked brown rice. • Just you at home? No worries. There are plenty of recipes geared to one or two people. Check out this site for ideas. • If time is an issue for getting dinner on the table during the week, spend some time on the weekend cooking. For example, make up a pot of chili, beef stew, or chicken soup and freeze it for the week ahead. • Get your family involved. Give each family a member a job, such as washing and preparing vegetables, setting the table, or cleaning the dishes afterwards. • Invest in a slow cooker. They’re not expensive and you can literally throw all of the ingredients into the slow cooker in the morning, keep it on low all day, and come home to a ready-made meal. What could be easier? Another helpful website to get you started with cooking is “the kitchn.” You’ll get recipe ideas, tips for helpful kitchen equipment, and tips on how to make even the most basic foods and dishes, such as how to boil an egg. Remember, too, that cooking and eating at home give time for you and your family to catch up on the day and spend some quality time together. At the same time, you’ll be giving a boost to your health and helping your diabetes, too.